SPORTSMANSHIP: Johnny O'Brien, left, said "thanks" last night to Ray Foleen, right, Portland University basketball captain, afer Foleen presented Johnny with the ball used in the game in which the Seattle U. sharpshooter broke the national scoring record. The ceremony was held during halftime of the Chieftain-Pilot basketball contest at the Civic Auditorium. Johnny used the ball to bring his season's total to 970 points at Portland a week ago. Jack Gordon, Seattle U. athletic publicity director, looked on. NEW YORK, March 1.—Johnny O'Brien, Seattle University's whiz with the basketball, has given the Far West its first cage-scoring champion in history. Statistics of the N.C.A.A. Service Bureau showed today that O'Brien—first collegian to score more than 1,000 points in one season—had ended his regular season play with an average of 28.6 points in 36 games. O'Brien's nearest contender for scoring honors is Harm Hoffman of Brooklyn Poly, with an average of 25.9 points in 19 starts. Brooklyn plays its final game tonight against Pratt Institute, but Hoffman would have to score 86 points to match the Seattle ace's average. In two games against Portland University Thursday and last night O'Brien bagged 60 points, hoisting his year's total to 1,030. Prior to this season, every individual collegiate-scoring championship — for major as well as small schools—has been won by either a Midwesterner or Easterner. A modest, but nervous John O'Brien last night received two awards at the half-time of the Seattle University-Portland University basketball game. 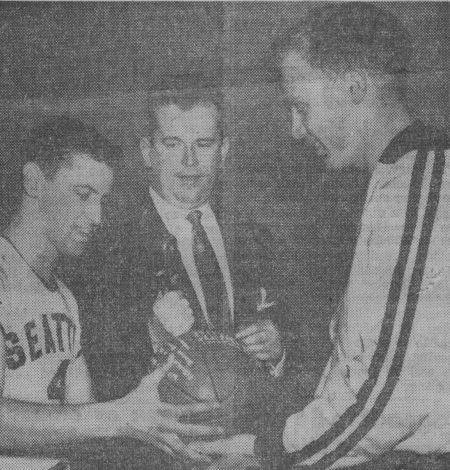 Ray Foleen captain of the Pilots, presented John with the ball used at the Rose City last week when the Seattle flash established a new national scoring record, eclipsing the mark of 967 set by George Kmg of Morris Harvey in 1950. "To a great player on a great team," was Foleen's comment. The ball was autographed by all players of the Portland team. The second award was a large silver basketball presented by Mike Donohoe, president of the Puget Sound Sports Writers and 'Casters, for Seattle University. "I've had so many nice things said to me tonight, I'm anxious to hear what I'm going to say." "I want to thank all the boys who helped, for without them I never would have got where I got."